For other uses, see Al-Ahly (disambiguation). Al Ahly Sporting Club (Classical Arabic: النادي الأهلي الرياضي, English translation:The National Sporting Club) is an Egyptian sports club based in Cairo, Egypt. It is known as "The Club of the Century" in African football. It is best known for its professional football team that plays in the Egyptian Premier League, the top tier in the Egyptian football league system, and is the most decorated football club in Africa. It was founded on 24 April 1907, as a gathering place for Cairo's Student Unions. Al Ahly has a record of 40 national league titles, 36 national cups titles, and 10 national super cup titles making Al Ahly the most decorated club in Egypt. In addition, Al Ahly has never been relegated to the Egyptian Second Division. In international competitions, the club has won a record 8 CAF Champions League titles, a CAF Confederation Cup title, a record 6 CAF Super Cup titles, a record 4 African Cup Winners' Cup titles, an Afro-Asian Club Championship title, an Arab Club Champions Cup title, an Arab Cup Winners' Cup title, and a record 2 Arab Super Cup titles. Al Ahly also won the bronze medal in the 2006 FIFA Club World Cup. Al Ahly is the second most successful club in the world in terms of number of international titles (24) behind Real Madrid (26). The idea of establishing Al Ahly in the first decade of the century was raised by Omar Lotfy during his presidency of the High School Students Club which was established in 1905 The establishment of the club of high school students was for political reasons, and found that these students needed a sport club that combined them for leisure and exercise. He introduced the idea of establishing the club to a group of friends who were enthusiastic about the idea. In 1907, Al Ahly was established. Omar Lotfy abdicated the honor of the position of the president of the club in favor of Michel Anse, who was an advisor to the Ministry of Finance at the time to facilitate financial support for the club. An official meeting of the club's board was held on 24 April 1907. The committee met at 5:30 pm in the house of Michel Anas Giza in his chairmanship and the membership of Idris Ragheb Bey, Ismael Sari Pasha and Sami Basha and Omar Lotfi Bek and Mohamed Effendi Sherif as secretary The establishment of the club was approved and Ismail Seri designed the main building of the club as an architect. A civil company on behalf of Al Ahly Sports Club was established and shares of the company worth 5EGP Pounds per share, and was the goal of the club when it was established to raise the amount of 5000 pounds, but it was Collected 3165 pounds over a year and that was not enough, which forced the club to borrow 1,000 pounds from the National Bank of Egypt in March 1908 by Omar Sultan and Idris Ragheb and Talaat Harb which contributed 100 pounds to the establishment of the club. First honorary president of the club was the leader Saad Zaghloul in his position as Ministry of Education that time. The name of the Al Ahly Sporting Club was suggested by Amine Samy Amin, to serve the students and graduates of high schools who were the mainstay of the revolution against the English occupation. On 2 April 1908, Michel Inse stepped down as president of the club. Aziz Azzat was appointed as new president and became the first Egyptian president of Al Ahly. The official opening ceremony of the club was held in the club's main building on 26 February 1909. Although the game of football was not one of the goals of the founders of Al Ahly club the goal of the club was openining its doors to students of higher schools to meet and practice political dialogues, but the graduates of high schools members of the club have fallen in love with football, which prompted Ahly to build the first stadium in 1909 and they used to call it the time (Al-Hawsh), which is a colloquial word from Egyptian dialect means the courtyard in Arabic. The stadium was developed over the years to be Mokhtar El-Tetsh Stadium. The first official football team was established in 1911. The team is one of the primary and secondary school players who played the ball in Al-Hawash, which was established in 1909 in the club's land. The names of the first players of Al Ahli club were as follows: Hussain Higazi, Abdel Fattah Taher, Fouad Darwish, Hussein Mansour and Ibrahim Fahmy. The star of this team was the striker Hussein Hegazi. In 1917, Al Ahly wanted to demonstrate the strength of the Egyptian clubs against the Allied military teams founded by Britain in Egypt. Al Ahly agreed to play against Zamalek SC, which was under the control of foreigners at this time. The match was held on 9 February 1917 at Zamalek Stadium. Al-Ahly won 1-0 with a goal scored by Abdulhamid Muharram. In 1918 the club first official participation was held. After Al Ahly refused to compete with the foreign allies for the first edition of the Sultan Husain Cup in 1917, the club decided to participate in the 1918 tournament. Ahly contributed with Zamalek SC, El Sekka El Hadid SC in the formation of the first football team of Egypt to participate in the Olympic games 1920. Al-Ahly contributed to the establishment of the Egyptian Football Association.In 1923, Al Ahly played an active role in the establishment of the Egyptian Tennis Federation. The Egyptian League championship began in 1948–49. Al Ahly won the inaugural competition, the first of nine successive national championship titles. Following the deposing of King Farouk in the revolution of 1952, Ahly appointed Gamal Abdel Nasser as club president. Al-Ahly did not win the league for 13 years. After years of deterioration, Ahly took the first steps to recovery when the management decided to sign the golden player of Hungary in the fifties, Nándor Hidegkuti, in September 1973 at a salary of fewer than 600 dollars. The title returned to Al Ahly in 1974–1975, with the team scoring 70 goals in 34 games. Ahly won the league championship in 1976–1977. This season saw the second participation in African competition, where the team fared better than the first time, bowing out in the quarter-finals to Hearts of Oak Ghana. Al Ahly won the 1981–1982 tournament, defeating Ghana's Asante Kotoko S.C. in the final, winning the first leg 3–0 thanks to two goals by Mahmoud El Khatib and one by Alaa Mayhoub. In the return match in Kumasi, Mahmoud Khatib returned to score again and the game ended 1–1, with Al-Ahly winning their first continental championship. Al-Ahly reached the final of the African Champions League for the second time in a row in 1983, but rival Kotoko managed to avenge their defeat by scoring the only goal in both matches. Al-Ahly reached a continental final again in 1984; this time the African Cup of Nations Cup. Against Cameroon's Yaounde, Al-Ahly won on penalties in the Cameroonian capital after a 1–1 draw in both games. For the third time in a row, Al Ahly won the African Cup in 1986 after winning the league championship. Ahly defeated g Sujara in the final 3–2 on aggregate, with Taher Abouzeid scoring two goals and Magdi Abdel Ghani one goal. After winning the Egypt Cup for the third time in a row in 1993, Al Ahly returned to Africa by winning the African Cup Winners' Cup for the fourth time in its history in 1993, which was the last participation of the club in this tournament. Al Ahly has won the African Cup Winners' Cup four times, more than any other team. Al-Ahly beat Ivory Coast's Africa Sports d'Abidjan in the final with a penalty by Adel Abdelrahman in Cairo Stadium after a 1–1 draw in the first leg. In the same season, Al Ahly won the Egyptian Cup by beating Ghazl El Mahalla SC 3–2 in the final. Al Ahly participated in the Arab Championships for the first time in 1994 after a decision to boycott the African tournaments due to weak financial returns. They won the cup by defeating Al-Shabab FC (Riyadh) with a goal by Felix Aboagye in the final. After leading Al Ahly to its second consecutive league title and the Arab Super Cup in Morocco, Rainer Holman left Al Ahly at the end of 1997, after finishing second in the Arab League Champions League in Tunisia. He was replaced by his countryman Rainer Tsubil, who succeeded in winning the league championship for the fifth consecutive season in 1997–1998. Al Ahly won the 1998 Arab Super Cup title with Tsubil for the second successive season after beating MC Oran, Algerian, Saudi Arabia, and African-Tunisian. Al-Ahly returned to the African partnership for the first time in six years. In the summer of 2001, Ahly signed Manuel Jose to take on the technical leadership of the team and this was the first time in the history of the club, which is used by a coach from the Portuguese school. Jose's first acquaintance with Al Ahly was the friendly match against Real Madrid in August 2001, when the Reds shocked Europe's oldest club with the goal of Nigerian Sunday Ebege. It was the fourth time in history that Al-Ahli had defeated a European team with a newly crowned Champions League title. Al-Ahly won the African Champions League title 4–1 victory over South Africa's Mamelodi Sundowns F.C.. Al Ahli also confirmed his continental supremacy by grabbing the Super Cup with another landslide victory over South African team. This time the victim was Kaizer Chiefs F.C., who lost 4–1 in Cairo in a match in which Ahly goalkeeper Essam El-Hadary scored his historic goal. Jose was unable to collect any local championship in his first term. Al-Ahly also won the first Egyptian Super Cup with an exciting win over ENPPI Club 1–0, with a goal in extra time by Wael Gomaa. At the end of 2005, Ahly won the African Champions League for the fourth time in their history after Tunisia's 3–0 defeat of Étoile Sportive du Sahel in Cairo before winning the Super Cup by beating Association Sportive des FAR with penalties. Al Ahly then appeared at the FIFA Club World Cup in Japan for the first time, but the start was not successful as the team lost to Sydney FC and then Saudi Arabia's Al-Ittihad Club (Jeddah). Many believe that 2006 is the best in the history of Al Ahly in terms of various achievements, starting with the Super League for the second time with another exciting win over Enppi with the goal of in stoppage time. Al-Ahly is also re-winning the league title for the second time in a row. Al Ahly then returned to the Egyptian Cup with a big 3–0 win over Zamalek SC, scoring the full mark in local championships. Then Africa again and reaches the final with CS Sfaxien the first league in cairo stadium ended 1-1 to reach the return game to the last seconds and the result was 0-0 until the historic moment where left foot of Mohamed Aboutrika set a new history in the letters of gold in the records of Ahly. Al Ahly reached world cup for clubs in Japan and got the bronze medal as third place for the first time in African history after beating Auckland City FC New Zealand and a 2–1 win over Club América in Yokohama. The red control continued on the league's shield and Al Ahly won the title by 17 points away from Ismaily SC. The team also won the Super Cup for the fourth time in a row by beating Al Zamalek 2–0 with goals by Ahmed Hassan and Moataz Eno. Al Ahly won African champions league for the sixth timr with a 4–2 win over Coton Sport FC de Garoua in the final two games, Ahly set off for the Club World Cup again, but this time the results were not good, with two defeats from C.F. Pachuca and Adelaide Football Club . Al-Ahly started 2009 with the title of the Super African Cup after defeating CS Sfaxien 2–1 with Flávio Amado's goals, before the start of an exciting race on the league's shield with Ismaily, who became the top until the last two minutes of the season. After Ismaily beat Tersana SC, Al-Ahly held the lead against Tala'ea El-Gaish SC until the 93rd minute, when Ahmed Fathi scored the winner's winner and striker Mohamed Talaat added the goal of the promotion to lead the two leaders to a playoff to determine the hero. Al Ahly won the match 1-0 by Flavio goal and won the Egyptian league shield. It was the last Portuguese championship for Manuel Jose during his second term before leaving and leaving the team's leadership to Hossam El-Badry. Hossam Al-Badri managed to keep the shield in Al-Ahly's 2009–2010 cupboard to become the first national coach to win the league championship in 23 years, before Al Ahly won the Egyptian Super Cup by defeating Haras El Hodoud SC 1–0. In the African Champions League, Al Ahly qualified for the semi-finals but was knocked out by Espérance Sportive de Tunis because of a famous referee Joseph Lamptey mistake that gave the hosts a win in the return game with a clear touch of hand goal by Michael Eneramo. the sports activity in Egypt was postponed because of Port Said Stadium riot. In the first match after the return of sports activity, Ahly won the Egyptian Super Cup when defeated Enppi 2–1 in a sad match at the empty stadium of Borg El Arab Stadium. Despite the difficult events, the men of Al-Ahly overcame all circumstances and achieved the African Champions League for the seventh time when they beat Esperance in the Tunisian home 2-1 by Gedo and Walid Soliman, after finishing the first leg 1–1. Hossam Al-Badri left the team to Mohamed Youssef, who managed to complete the march successfully and lead Ahly to the African Champions League for the eighth time by beating South African Orlando Pirates 2–0 in the return match after a 1–1 draw. The return match was the last impression of the fans of the legend Mohamed Abotreka when he scored the first goal to be the last goal of his eternal journey in the red shirt. Al Ahly made his way to the African Confederations Cup after an early exit from the Champions League, but the Red Giant had a strong new impetus, which was the addition of this continental tournament to the club's first-ever cupboard. Indeed, Al Ahly reached the final against Séwé FC but lost the first game 2–1. In the return match, the draw went on until the sixth minute of stoppage time. At a historic moment, Ahly's determination to win, Emad Moteab grabbed the goal of the coronation with a deadly header that made every fan celebrating in Cairo stadium and made coach Juan Carlos Garrido running in Hysteria on the pitch. With this victory. Al Ahly went through a critical phase after the most of stars of the old generation retired, causing the loss of a number of tournaments until the team regained its balance when they met with Zamalek to determine the Super Cup champion in the game that was held in Dubai for the first time at the end of 2015. Abdul-Aziz Abdul-Shafi led the Red Giant to a 3–2 win over Zamalek to add the ninth Egyptian Super cup in the club's history. Al Ahly won the league title after only missing one season in 2015–2016, seven points difference between champions Zamalek, and Ahly finished the competition as the strongest attack and the strongest defense under the leadership of Dutchman Martin Jol. Al Ahly won Premier League title for the 39th time in his history before the end of the league with four rounds, he has also managed to play the 39th game in a row without losing any defeat at all competitions. Al Ahly has achieved a special number in the number of games without defeat 30 games in the league. under the leadership of Hossam El-Badry Al Ahly was able able to keep clean sheet in 30 games this season in various local and continental competitions so far this season. Al-Ahly won the Egyptian Cup for the 36th time in his history after beating Egypt 2-1 in a marathon match at the Egyptian Cup final at Borg El Arab Stadium. Al-Ahly proved Al-Masri scored in the 102nd minute before Amr Gamal equalized in the 117th minute and Ahmed Fathy added the winner in the 120th minute. Al Ahly won CAF Champions League in 1982 and 1987. They triumphed again in 2001, 2005, 2006 and 2008 under the coaching of the Portuguese Manuel José, in 2012 and finally in 2013 under the coaching of Hossam El-Badry in 2012 and Mohamed Youssef in 2013; making them the most crowned team in Africa, with 8 Champions League, One Confederation Cup, 4 Cup Winners' Cups, 6 Super Cups and One Afro-Asian Club Championship. The Cairo Derby, is a football match between Egyptian clubs Al Ahly SC and Zamalek SC. It is a match between arguably the two most successful clubs in Egypt and Africa. Ahly and Zamalek were named by the Confederation of African Football (CAF) as The 1st and 2nd African Clubs of the 20th Century respectively. Both teams are located in Greater Cairo and their matches are considered the highlight of the football season with a live broadcast to most of the Middle Eastern and North African countries since the 1970s. Usually the derby is played twice each season with two matches in the Egyptian Premier League, but it is not uncommon to find the teams meeting each other in the Egypt Cup, especially in the final, and in Africa's most prestigious club competition, the CAF Champions League. Al Ahly has a large fanbase of ultras named Ultras Ahlawy (UA07) which is known for its pyro displays. Their motto is Together Forever, Ultras Ahlawy raised its banner for the first time at a match against ENPPI Club on 13 April 2007, Ultras Ahlawy also supports the Al-Ahly basketball, volleyball, and handball teams. 2005 represented an especially unique season in Ahly's illustrious history. The team would go on to set an unprecedented record of going an entire season being unbeaten in almost all possible competitions. 46 matches were played in the Egyptian Premier League, Egypt Cup, Egyptian Super Cup and CAF Champions League, with Ahly remaining unbeaten in all of them (as well as winning 5 from all 6 trophies). Amin Sami Pasha was the first one to propose the name of the Al Ahly Athletic Club. Al Ahly was named because it was created to serve the students and graduates of the high schools who were the mainstay of the revolution against the English occupation. Although the game of football was not one of the goals of the founders of Al Ahly club the goal of the club was openining its doors to students of higher schools to meet and practice political dialogues, but the graduates of high schools members of the club have fallen in love with football, which prompted Ahly to build the first stadium in 1909 and they used to call it the time (Al-Hawsh), which is a colloquial word from Egyptian dialect means the courtyard in Arabic. The stadium was developed over the years to be Mokhtar El-Tetsh Stadium. Currently the stadium hold the team training and friendly games. Al Ahly formerly played their home games at their own ground, Mokhtar El-Tetsh Stadium, but its capacity was too small for the club's support so they turned Mokhtar El-Tetsh Stadium to their Training Ground. 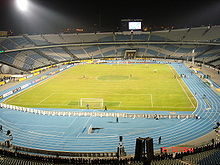 As a consequence, Al-Ahly moved to play their home games at the Cairo International Stadium. Al Ahly stopped playing their home games at the Cairo International Stadium since 2014 for an indefinite period due to security reasons. In the 2016–2017 season Al Ahly played most of their home games at Al Salam Stadium and played their matches in the African competitions at Borg El Arab Stadium.At first leg of Egyptian League 2017-2018 AL Ahly returned to play at Cairo International Stadium. Al Ahly SC Stadium (Arabic: استاد النادي الاهلي‎) is a football stadium currently under construction in Cairo, Egypt. It will also host Al Ahly SC matches, replacing Cairo International Stadium.It will have a capacity of 60,000 spectators. Al Ahly TV is an Egyptian-Arab channel that currently Broadcast the football team friendly matches, youth team matches, Al Ahly other sports matches. The channel was established in 2008 in cooperation with Arab Radio and Television Network. The official broadcast of the channel was launched on 12/3/2010 When Hassan Hamdy former club president announced the opening of the channel. Wikimedia Commons has media related to Al-Ahly Sporting Club kits. On 3 November 1917, Mohammed Sharif Sabri Bek, a member of the club, and King Farouk, designed the first logo for Al Ahly. It was an oval shape adorned with the crown of the Egyptian king at the upper end, symbolizing the royal rule of Egypt at the time. The eagle was shaved then changed to half red and half white and then became red only because of Egypt's flag at the time of the era of Abbas Hilmi II. The slogan was added in the celebration of Al Ahly being founded. These are the footballdatabase club's points 9 September 2018. Note 1: Fathi Mabrouk was an interim manager 5 times. Note 2: Manuel José and Hossam El-Badry are the only 3 term managers in Al-Ahly history. Note 3: A. Abdul-Shafi was an interim manager 3 times. ^ "CAF African Clubs Ranking". RSSSF.com. Retrieved 2009-09-24. ^ "International Cups Trivia". Rec.Sport.Soccer Statistics Foundation. Retrieved 18 December 2016. ^ Gifford, Clive. "Al-Ahly". Encyclopædia Britannica. Encyclopædia Britannica. Retrieved 5 September 2017. ^ Parkinson, Gary (29 April 2016). "Into the top 10 and the cauldron of fervour that is the biggest derby in Egypt..." Four Four Two. Retrieved 5 September 2017. ^ alahlyegypt. "تفوق عربي – الموقع الرسمى للنادى الأهلى". alahlyegypt.com. ^ alahlyegypt. "استمرار المدرسة الألمانية – الموقع الرسمى للنادى الأهلى". alahlyegypt.com. ^ alahlyegypt. "رحيل جوزيه بعد نهاية مثيرة – الموقع الرسمى للنادى الأهلى". alahlyegypt.com. ^ alahlyegypt. "تفوق محلي وظلم إفريقي – الموقع الرسمى للنادى الأهلى". alahlyegypt.com. ^ alahlyegypt. "من أجل الشهداء – الموقع الرسمى للنادى الأهلى". alahlyegypt.com. ^ alahlyegypt. "اللقب الثامن واعتزال الساحر – الموقع الرسمى للنادى الأهلى". alahlyegypt.com. ^ alahlyegypt. "الأكثر تتويجا…برأس متعب – الموقع الرسمى للنادى الأهلى". alahlyegypt.com. ^ alahlyegypt. "بطل الدوري 38 – الموقع الرسمى للنادى الأهلى". alahlyegypt.com. ^ "Coton Sport 2–2 Al Ahly". BBC Sport. 16 November 2008. Retrieved 30 October 2009. ^ "Summary – Premier League – Egypt – Results, fixtures, tables and news – Soccerway". ^ "Summary – CAF Champions League – Africa – Results, fixtures, tables and news – Soccerway". ^ "النادي الأهلي (مصر)". 24 September 2017. ^ "Ahly Captains in History". Wikimedia Commons has media related to Al-Ahly Cairo.